Industrial packaging is packaging for the manufacturers, for the big producers in businesses. Sometimes, standard packaging isn’t enough for the product, and need more protection to makes sure product stays safe, lasts longer, and makes it to the customer in the right condition. Standard wraps and papers can’t protect from the harsh conditions, long shelf times, and environmental damage that industry products face, so having the right protection for the products is essential to maintaining quality and consistency. There are many different types of industrial packaging wraps, papers, fluids, and sprays. Rising globalization and international trade are supporting the industry growth. Growing commercial industries such as chemical, pharmaceutical, construction, and electronics sector further propels the demand. The developed economies are the highest producers and consumers of these products. Whereas increasing demand in emerging economies will further drive the industry growth. The market for industrial packaging is growing due to increasing trends in end-use industries. The market growth due to increasing trend in the chemical industry output combined with the increasing healthcare needs of drugs and medicines for the aging U.S. population, coupled with continuing innovations in drug development. The global industrial packaging market had reached to reach US$53.03 bn by the end of 2016. The industrial packaging market segments the product into drums, intermediate bulk container (IBC), crates, sacks, pails, tubes, and bulk boxes. IBCs are the leading packaging type in terms of popularity. Plastic sacks are replacing paper & jute sacks owing to its benefits such as low cost, lightweight, durability etc. The industry segments the material into metal, plastic, paper and wood, and fiber. The plastic material segment is the most preferred type by the manufacturers owing to its various properties such as cost effective than other materials, can be molded in to specific shape and size, and durability. By type, the industry segments as rigid and flexible packing. Flexible segment includes paper & plastic whereas rigid sub-segment includes wooden, metal, and plastic. Increased use of polyethylene terephthalate (PET) in place of heavy metal cans will influence positively on the market. The flexible segment, plastic has a higher growth rate owing to technological advancements. By end use or application, industrial packaging market cater to various industries such as agriculture & horticulture, building & construction, automotive, chemicals & pharmaceuticals, food & beverage, engineering, metal products, plastic & rubber, electronics, and furniture. Of these, flexible packaging is expected to gain tremendous popularity over the coming years, due to the improvements in flexible packaging in terms of toughness and spatial minimization. Geographically, the global industrial packaging market is classified as North America, Asia-Pacific, Europe, Latin America, and Middle East and Africa. The rise in the demand for the industrial packaging from the industry is the main factors that are boosting the global market in Asia Pacific region. Use of advanced technology in the production of the industrial packaging has boosted the global market in North America. Europe, Latin America, and Middle East and Africa are likely to witness a slow growth in the global market. Industrial good are bulky, heavy, hazardous to environment, and sensitive to outer atmosphere. Thus, it is important to maintain the product for a long time at the time of transportation and storage. Industrial packaging differs from other types of packaging in terms of strength, thickness, and degree of protection is offers for prolonged storage. Increase in the activities of building and construction across the globe and other sectors such as foods and beverages along with swift growth of export industry are expected to augment the overall development of the global industrial packaging market over the course of the given forecast period of 2016 to 2024. The global market for industrial packaging could be segmented in terms of the different product types and types of material used. The global market could also be segmented in terms of the packaging type, end use of these packaging, and by region. Such in depth and decisive market segmentation of the global industrial packaging market provided by the report aids in understating the overall growth prospects and the future outlook of the different segments of the market and thus, helping the potential buyers to make informed decisions while investing in the market. The report on industrial packaging market offers the analysis and forecast on regional as well as global level. It offers historical data of the year 2015 along with the anticipated data of 2017, and a forecast data up to year 2024 in terms of volume and revenue. The report also offers key driving and restraining factors for the growth of the global industrial packaging market and their effect on every region over the course of the given forecast period. The report also gives the value chain analysis of the market with a list of manufacturers of raw materials, drum manufacturers, IBCs manufacturers, and crates and pails manufacturers. The research report on the global market for industrial packaging offers crucial growth prospects and prominent trends and opportunities that may come up in the market over the course of the given forecast period. The research report is the result of in-depth and extensive primary as well as secondary research methodologies backed by crucial market insights offered by the industry professionals. 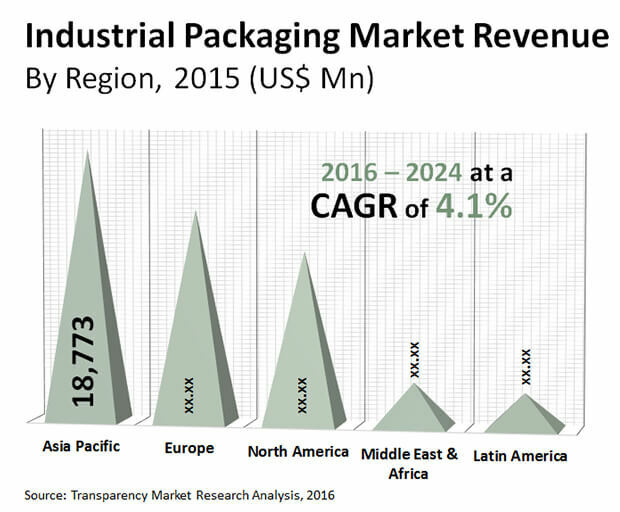 The overall growth of the industrial packaging market is expected to be chiefly driven by the evolution of industries across the emerging economies in the world. This factor is also expected to remain consistent over the course of the forecast period for the manufacturers in the market. Another important driving factor for the global industrial packaging market is the increasing use of containers with high value, owing to the development of the industries and the more efficient utility provided by these containers. The market is also expected to be propelled by the growing trend of launching innovative products and customizable packaging solutions offered by the market vendors. The global market for industrial packaging can be segmented into key regions such as the Middle East and Africa, North America, Europe, Asia Pacific, and Latin America. The market is currently dominated by North America and Europe owing to their advanced industrial setup and streamlined and better processes of delivery and transport. Asia Pacific market for industrial packaging is expected show promising growth over the given period of forecast. Some of the key players in the global industrial packaging market include names such as Smurfit Kappa Group, Sonoco, Nefab Group, International Paper, Grief Inc., and Sealed Air Corporation, AmeriGlobe, Tekni Films Inc., and B.A.G. Corp among others.